The week has continued to hint at cold things to come, but we have been spared any extreme gales so far. Between rain showers I have done just enough work in the garden to be sure that it is all still there. I hid in the greenhouse for a while and sowed all the seed that has arrived in the last few weeks but in the end I was paying more attention to the rain drumming on the roof than to the seed and spilled a packet of precious Amaryllis seed all over the bench. I had to go and find a pair of glasses to pick it up and by the time it was done enthusiasm had washed away. Just as I was accepting that winter had come thus Habranthus appeared. I continue to refer to it as Habranthus martinezii because that is what the original packet of seed promised but I am certain it is something else. Here ends the certainty. It is most probably a form of H. robustus, a variable species that originated in Argentina and the adjacent parts of Brazil but has now spread almost worldwide, wherever suitable habitat exists. It produced bulbils abundantly and spreads very easily by seed, although it has yet to appear in any other pots in the greenhouse. 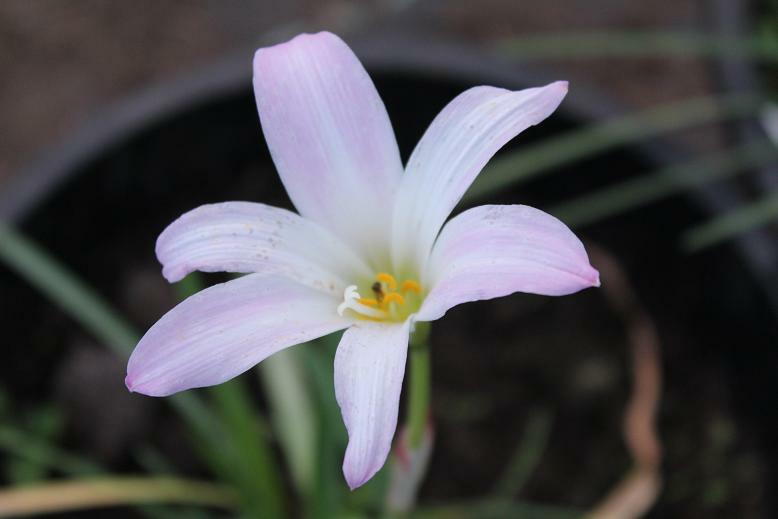 All the members of the genus are referred to as Rain Lilies, often flowering within days of a good soaking. In habitat it is often dormant through the hottest month of summer, and flowers in the autumn. In cultivation it will flower at almost any time of the year if it is watered after a dry period. I tend to water anything among the bulbs that has leaves and as a result it is more or less evergreen with me and flowers unpredicably. The Nerine have continued to produce flowers. The long warm summer produced an early season this year. At the start of October it looked as though they would all be over by now. Fortunately a number of the later cultivars didn't start to grow spikes until I watered them for the second time about three weeks ago. It now looks like there might be a few flowers that last into December. This plant of Mansellii is at its peak, injecting the sort of vibrant pink that can pierce the gloom of autumn. It is one of a group of seedlings raised by Mr. Mansell in Guernsey in 1880. That much is recorded well enough to mean it is probably true. In 1888 Baker listed it as a hybrid between N.flexuosa and N. fothergillii. From a modern taxonomic viewpoint those are considered synonyms of N. undulata and N. sarniensis respectively. The form and colour of the flowers and the late blooming certainly seem appropriate. The earliest available name for the hybrid would seem to be N. x versicolor Herb. (1821). There were a number of seedlings raised by Mansell though I think it unlikely that more than one of them have survived the following century. In a group of seedlings people rapidly identify the best, and that is the one they want. 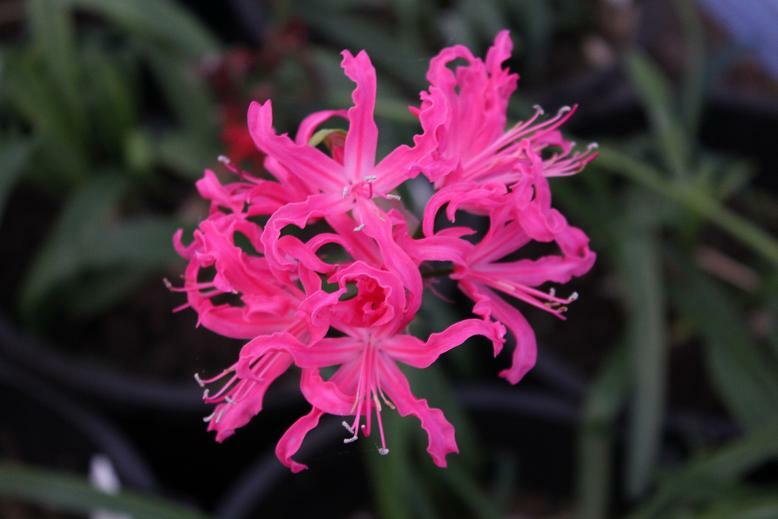 Nerine names seem to be coming under review at present and it is probably wise to avoid leaping to conclusions but N. x versicolor 'Mansellii' seems a reasonable name. It is possible that the original clone has produced some seedlings along the way, so Mansellii Group covers all possibilities. I take a certain wry, wintery pleasure in the observation that after two centuries of serious academic botany we are still tentative. Bulbs have a certain thrill about them. Something about the sudden revelation from a hidden dormancy that is the turning point of a detective novel. A stab in the dark. Bulbs have drama. Shrubs work quite differently. Even those that clothe their bare winter stems with flowers lack drama. They ooze slowly. If you walk through seasonal mists in a wool jumper you will trap little beads of water on the fabric that cling like flowers on a Viburnum. It is more about determination than drama. 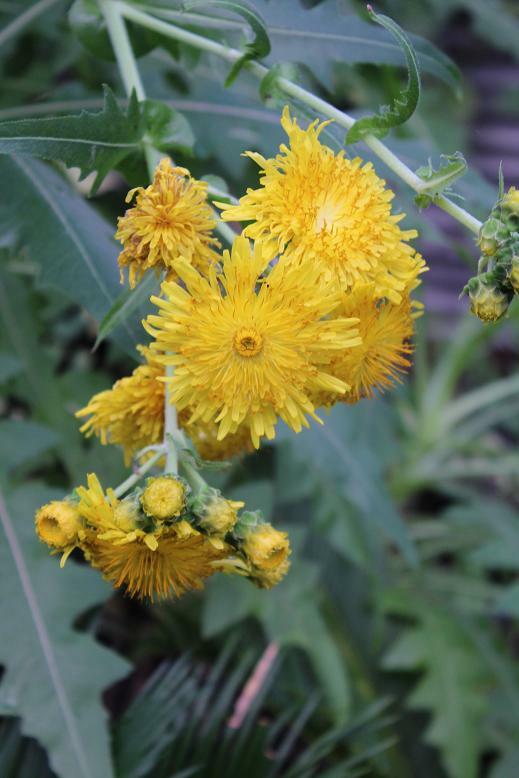 The Tree Sonchus have a style of their own. Not quite weedy, not quite dramatic and not quite reliable. This cluster of yellow flowers manages to look like a precious bonus, a trick only achieved because there are so few dandelions in flower at the moment. I have a few Sonchus species, all planted in the Agave House where it is warm and dry through the summer. As a consequence they go through an enforced summer dormancy when they stop growing and become the target of choice for red spider mite. S. pinnatus escapes their predations by dropping all its leaves and feigning death. The others look dreadful. In the cool of autumn they start back into growth and the rosettes of leaves become lush. The first flowers on S. congestus suggest that in habitat on Tenerife and Gran Canaria it grows through the mild winter, so that is what I will hope for. A heavy frost in December and I suspect this becomes black mush. Orientation makes all the difference. Looking down ones nose at something, while not a thing to boast about, seems to be very popular. Looking up ones nose at something however, unspeakable (and investigating with a finger beyond the pale). 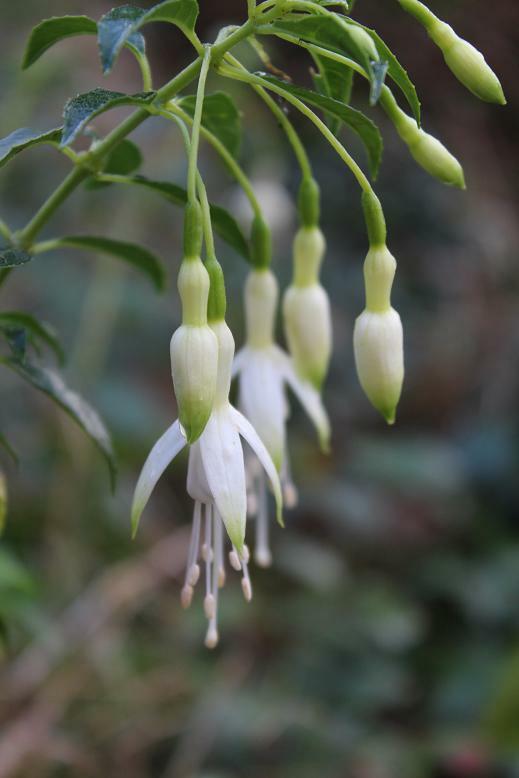 Fuchsia dangle away through the autumn while the herbaceous border thrusts solidly upwards. The former undervalued in my opinion, the tide of public opinion has turned against such easy and reliable plants in favour of a few yellow daisies and some dead grass. The tide will turn. Thirty years ago anyone who grew Dahlia hid them among the vegetables. Graham Thomas changed that almost overnight with a bold assertion that 'Bishop of Llandaff' was a good garden plant (the association with a bishop probably helped, I don't think 'Pink Cactus' would have hopped over the allotment fence so easily). Fuchsias are poised to make the same leap. All the fashionable gardens seem to be growing 'Hawkshead' at present. A little shrubby thing that could never be mistaken for bedding. The white flowers are tipped with green and have 'elegant' written all over them. Raised by Travis in 1962, a cross between F. magellanica var. molinae and 'Venus Victrix', recognition is long overdue.